Capital-intensive clean energy technology is not well suited to developing world growth. Reduced growth rates in poor countries have indirect costs in terms of slower gains in life expectancy and wellbeing. Slow-growing developed nations can derive significant net-benefits from clean energy deployment. The primary challenge the global community faces today is the need to triple the size of the global economy by 2050 while actually reducing CO2 emissions. This task is likely to be very difficult given the importance of fossil fuels in growth of the developing world (where ~90% of the projected growth will happen). It is critical that those who are very concerned about climate change (myself included) understand the importance of fossil fuels in developing world growth very well (e.g. 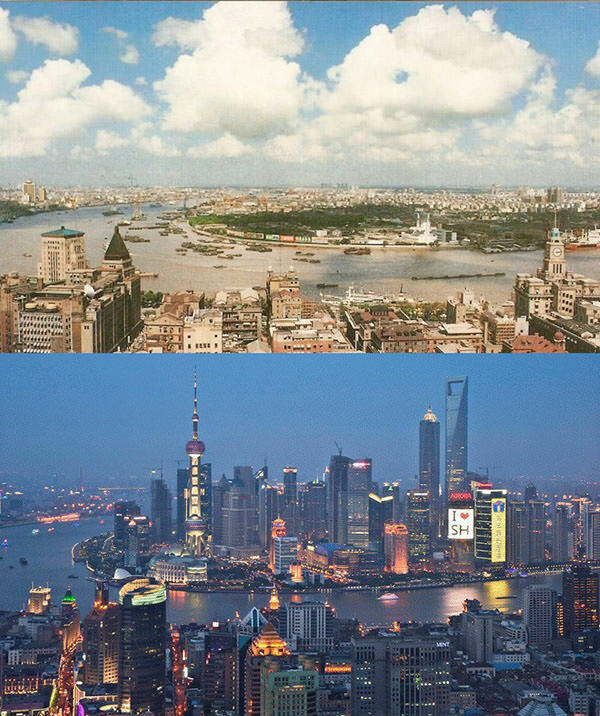 the 1990-2010 transformation of Shanghai shown below). In short, the majority of the world’s homes, roads, schools, hospitals, factories and business districts are yet to be built. This gargantuan infrastructure buildout simply is not going to happen without fossil fuels. Yes, once this heavy lifting is done (as in the developed world), fossil fuels can be left behind, but the problem is that only about 20% of the world population has reached this point to date. It is undeniable that fossil fuels have significant externalized costs in terms of reduced life expectancy and wellbeing from pollution and climate change. However, reduced growth from forced deployment of clean energy also reduces the growth in life expectancy and wellbeing. Lower growth in poor countries therefore not only has an internalized cost (lower GDP), but also an externalized cost relative to the benchmark fossil-fueled growth path (e.g. relatively higher child mortality rates, more preventable deaths from infectious disease and, ironically, greater exposure to a more volatile climate system). This article will quantify the externalized cost of reducing the rate at which scenes like the one below are improved. To quantify, the graph below presents the correlation between “happy life years” and GDP per capita (data from the Happy Planet Index website). Happy life years is the product between life expectancy and a general wellbeing index. In my opinion, it is the best standalone humanitarian indicator out there. As a side-note, it is worth taking a moment to contemplate how sheer luck of birthplace can be the difference between 60 happy life years and 10 happy life years. 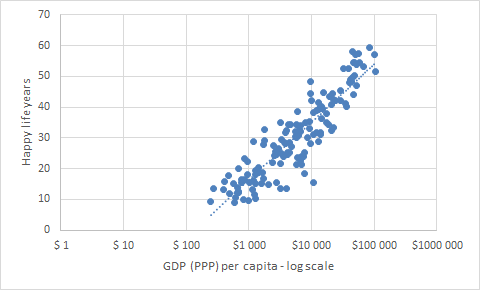 It is clear from the graph that happy life years increase logarithmically with GDP per capita. The rate of increase in happy life years is therefore directly proportional to the per capita growth rate of a country. Specifically, the best fit to the data says that the rate of increase in happy life years in any given year equals the yearly per capita growth rate divided by 13.1. In other words, if a country could grow at 13.1%, it would add one happy life year to its population every year. Insurance companies typically value a year of quality life at $50000. Let’s now assume that, for whatever reasons, a country grows below its potential by a full 5%. My country of birth, South Africa, is a good example of such a case where widespread corruption and incompetence in government has reduced growth to almost zero. In this case, every year of sub-optimal growth would cost 5/13.1 = 0.38 happy life years or approximately 0.38*50000 = $19000 per citizen. This rough estimate is meant to illustrate the truly enormous costs of sub-optimal economic development in developing nations. Dysfunctional political regimes are definitely the main culprit in this respect. As this article will illustrate, however, forcing the deployment of capital-intensive clean energy systems in rapidly growing economies can have a similar, albeit smaller, effect. Let me illustrate through the example of India, the most likely candidate to perform the next Chinese-style economic growth miracle. Let’s say that India determines to use clean energy technologies to cut its rate of emissions growth by half at a cost of 2% of economic growth (6% instead of 8%). The cost of one year of this practice would be 2/13.1 = 0.15 happy life years ($7500 per person), while the saving would be about 2.6 tons of CO2 over the remaining lifetime of the average Indian (based on 4% instead of 8% growth in current CO2 emissions of 1.6 ton/person, and life expectancy of 67 from a median age of 27). At $50/ton of CO2, this value amounts to only $130. 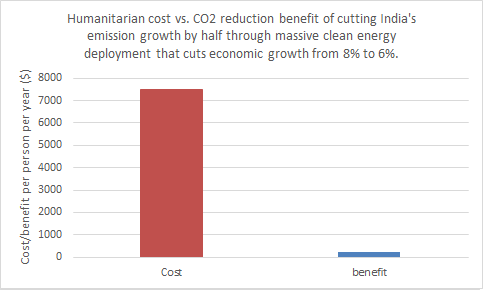 The massive difference between the humanitarian cost and CO2 benefit is illustrated below. It is therefore clear that any reduction in the rate of economic growth of developing nations for the sake of curbing CO2 emissions is not an option. Unsubsidized deployment of clean energy is perfectly fine, but subsidized deployment will inevitably shift economic output from more productive to less productive areas, thereby hampering economic development. Applying pressure on developing nations to subsidize clean energy production for the sake of climate change prevention is therefore simply unethical. Let us now quantify the cost of deploying capital-intensive clean energy technology on the growth of rapidly developing nations. The electricity sector is the most suitable candidate for clean energy deployment. In a hypothetical scenario where a rapidly growing country like India decides to grow its electricity fleet by clean energy instead of coal, it can roughly halve its rate of emissions growth. Let us now estimate the impact of such a move on economic growth. We will assume that an underdeveloped country has a growth potential of 8% per year under the conventional fossil-fuel driven growth path. This growth potential is the result of increases in the size and skills of the workforce as well as access to better technology and infrastructure. China has shown over several decades that this is a conservatively low estimate of developing world growth potential. If the country has a GDP of $100 billion, it can increase its GDP to $108 billion in the next year. However, if it decides to invest in more capital-intensive energy technologies instead of coal plants, a substantial portion of this surplus productive capacity will have to be deployed to build power plants instead of better housing, schools, hospitals, roads etc. 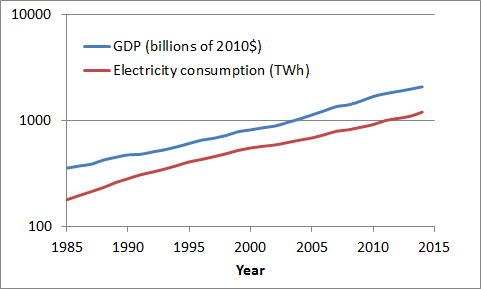 A developing country growing GDP from $100 billion to $108 billion will have to also grow electricity production from 62.5 TWh to 67.5 TWh (based on India’s ratio of GDP per electricity production shown above using data from the USDA database and the BP Statistical Review). Coal power plants at $1000/kW and 70% capacity factor can accomplish this for $0.82 billion, while solar PV at $1000/kW and 20% capacity factor will cost $2.85 billion. $2 billion of the $8 billion surplus productive capacity of the developing nation will therefore have to go into the construction of more expensive power plants producing the same amount of power, cutting real economic growth from 8% to 6%. Capital costs including 10% interest during construction: Coal: $989/kW; nuclear: $3142/kW; solar: $983/kW. Operating costs: Coal: $24/MWh for fuel ($70/ton coal) and $4/MWh other O&M, nuclear: $9/MWh for fuel and disposal and $7/MWh for other O&M, solar: $10/MWh for O&M. 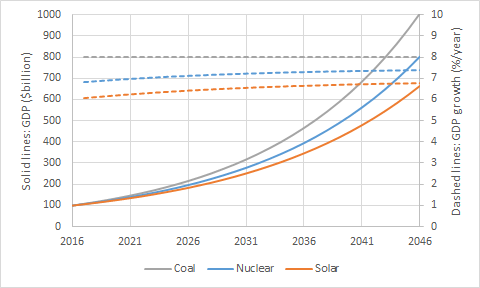 Capacity factor: Coal: 70%; nuclear: 90%; solar: 20%. Capacity credit: Coal: 100%; nuclear: 70%; solar: 20%. Solar PV capacity factor and O&M are assumed to be significantly more favourable than given in the IEA report because most developing nations have a good solar resource. 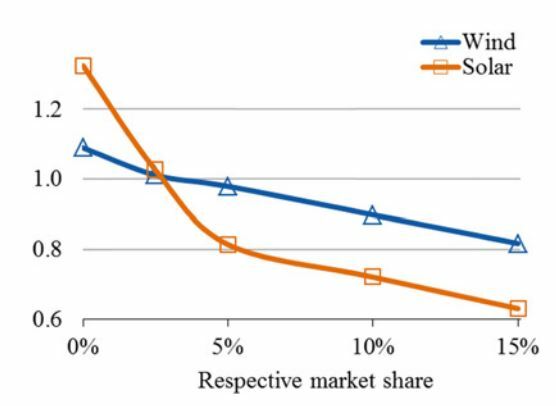 Future reductions in solar costs are assumed to be cancelled out by a steep fall in value with increased market share (below). It is clear from the graph above that the buildout of capital-heavy clean energy technologies consumes a substantial portion of the surplus productive capacity of the growing country. The result is a significant reduction in growth: a bit below 1% for nuclear and 2% for solar. 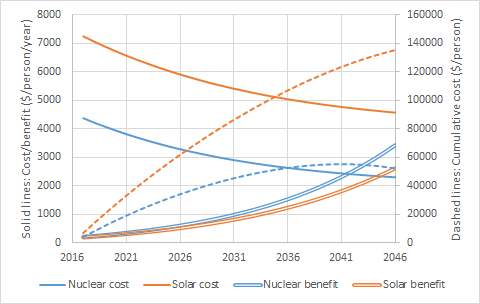 From this data, we can estimate the humanitarian cost in terms of happy life years and the benefit in terms of avoided CO2 and other emissions for both nuclear and solar. The method will be the same as outlined in the first example above. Avoided pollution costs are estimated as follows: A recent study found that coal fired power plants caused 86500 premature deaths in China in 2013. This sounds like a lot, but it is actually less than a tenth of all pollution-related deaths in China. We will assume that each premature death results in a loss of half of the 30 happy life years for Chinese citizens in the latest HPI data for a total cost of $65 billion per year (assuming a value of $50000 per happy life year as before). China generated 4200 TWh of coal-fired electricity in 2013, resulting in a pollution cost of $0.015/kWh. It is clear that the humanitarian cost in terms of lost happy life years becomes very large over time. However, the graph also shows that the yearly humanitarian cost slowly declines over time, while the benefit of avoided pollution and CO2 increases exponentially. For nuclear, the benefit starts exceeding the cost towards the end of the 30-year period under investigation. Still, the total accumulated costs per person of $52000 for nuclear and $135000 for solar are very large. This should be added to the internalized cost per person of reduced GDP amounting to $60000 for nuclear and $100000 for solar over the same 30-year period. When applying a discount rate of 8%, the total cost (GDP loss + happy life years loss – pollution avoidance – CO2 avoidance) amounts to $312 and $750/ton of avoided CO2 for nuclear and solar respectively. Naturally, these costs are just unacceptable. Note that this only holds for rapidly developing countries. If we change the situation to a developed country with a growth potential of only 2% per year and an initial GDP (PPP) per capita of $40000, the results look very different (see below). 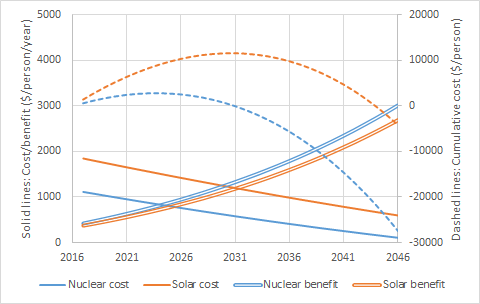 As shown above, the pollution avoidance benefit of nuclear and solar start to exceed the humanitarian cost of reduced growth much earlier. The accumulated result at the end of the 30-year period is a $27000/person benefit from nuclear and a $4000/person benefit from solar. This is just another illustration of how capital intensive clean energy technology may be a bad idea in the developing world, but makes good sense in slow-growing developed economies. This article was just another way to make the same point made in previous articles here and here: capital-intensive clean energy technology is best suited to developed economies with slow or stagnant growth. Forcing the deployment of these technologies in rapidly growing developing nations leads to disproportionate humanitarian costs arising from reduced growth rates. We therefore need to accept that the developing world will burn a lot of fossil fuels in order to get close to the living standards we developed world citizens take for granted today. In the meantime, we can clean up our own energy systems by ensuring that no unabated coal power plants are constructed and by evolving our social mindset beyond the current primitive consumerist paradigm. In short, we need to set a good example that developing nations can follow as soon as their pollution costs start to exceed economic development benefits. Putting pressure on developing nations to curb emissions growth while we enjoy the quality of life offered by an economy already built by fossil fuels is simply indefensible.